There are various options to connect external disc space to your PC/MAC but for larger data amounts – raster data or HD footage – you will likely try to use some of the faster options avail. As I invested into G-Drive harddiscs for satellite image data storage I have all fast interfaces already installed and a test of the connection speed was easily done. To get eSATA working all I had to do was to buy a 20€ ExpressCard eSATA controller for my MacBook Pro and thats it. 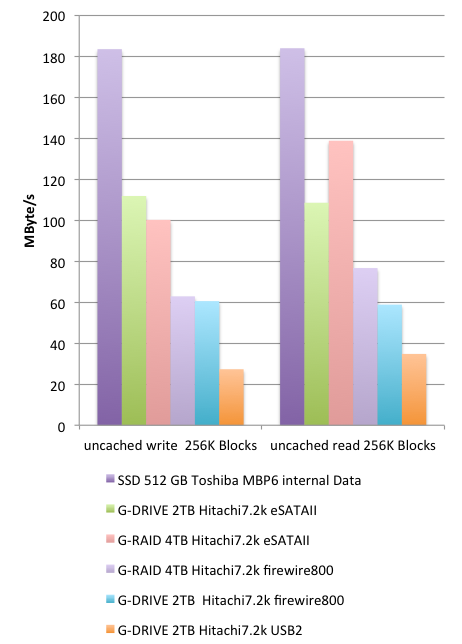 The internal SSD drive is the fastest – no suprise, but eSATA is a bit on the weak side suprisingly but about at the max of what G-Drive HDs are specified for with eSATA. The theoretical write speed for eSATA: 300 Mbyte/s, FireWire800 (ieee 1394b): 100 Mbyte/s, USB2: 40 Mbyte/s max).